but i was wondering if there are any excercises for expanding my chest voice downwards to hit some lower bassnotes since i love acapella music. right now my lowest note in chest (not full voice the volume drops from f2 downwards) is eflat2 before i need to use vocal fry or subharmonics and i would really like to hit a low c one day in my chestvoice! It is really hard to find good information on the subject on the internet besides waiting till your voice naturally drops once you get older and trying to relax as much as possible. I also now that basses for example have thicker and longer vocal chords than us baris which makes it easier to hit the low notes. So i guess I am asking if there are any ways (excercises in particular) to expand my chest range downwards just like i was able to get it higher? I think I can not help you. I have no clue which exercises could help on that, besides this free video from Ken. But it addresses the topic not in detail. It's okay thanks for being honest! Appreciate the fast reply. Thanks for the video link! 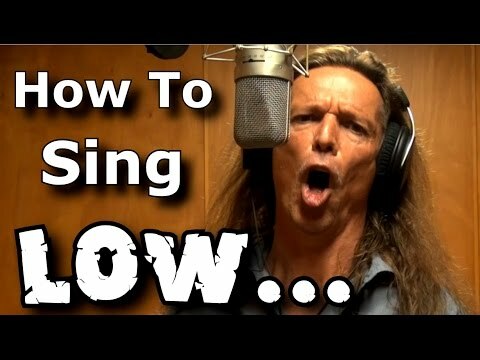 I've seen it and i've searched all over the Ken Tamplin courses and spent a lot of hours searching online and found some info about some techniques to help you sing lower. but indeed nothing that really gives me the clear information to either give me a way to expand my chestvoice downwards or give me enough proof that it is not possible. You can lower your larynx and that will help acoustically make your voice have lower tone. Even though you get that bass boost, you still want to keep the voice itself as bright as you can as you go lower. Otherwise you will have a tendency to sing flat, and lower notes are harder to discern pitch if you aren't bright enough. You will need to work to keep your breath even more steady as you go lower and lower in pitch, because the air pressure gets lower and lower as your pitch goes lower through more loosened cords. You can use your KTVA scales and sing 1 octave lower than you normally do. Go to the midpoint where it's high, and proceed to the lowest scales.